In 2007, Hanny's Voorwerp, a curious gas cloud, brighter than 30,000 suns with no obvious power source, was found floating in intergalactic space. Since that initial discovery, 19 similar clouds have been observed, all glowing apparently without internal power. Current think among the world's astronomers is that the clouds were probably powered by neighboring massive black holes that had blasted them with intense radiation. Hanny's Voorwerp–which means "thing" in Dutch– was discovered by the schoolteacher Hanny van Arkel while she was classifying galaxies as a volunteer for the Galaxy Zoo citizen science project. She noticed a weird blob that appeared intensely blue in the false-colour image she was examining and emailed the Galaxy Zoo researchers about it. "It became clear quickly just how special it was," says William Keel of the University of Alabama in Tuscaloosa, a member of the observation team, which was led by Chris Lintott of the University of Oxford, according to newscientist.com. The object's light spectrum shows that its glow comes from oxygen that has been ionised – stripped of some of its electrons – along with other ionised elements, making its true color green. It would take a huge amount of energy to ionise all this gas, but there was no hint of a source. Radiation from hot young stars could account for ionised oxygen in the cloud, but not the ionised neon: neon doesn't shine in the ultraviolet, as seen in the cloud, without lots of X-rays hitting it. The cultript appears to be a supermassive black hole found at the cores of most known galaxies with the matter spiralling into the massive holes generating huge amounts of X-rays. A galaxy called IC 2497 lies about 45,000 to 70,000 light years from the glowing cloud, and a black hole at its core could easily blast Hanny's Voorwerp with X-rays, but with one slightly major problem: IC 2497's core shows no sign of emitting X-rays. 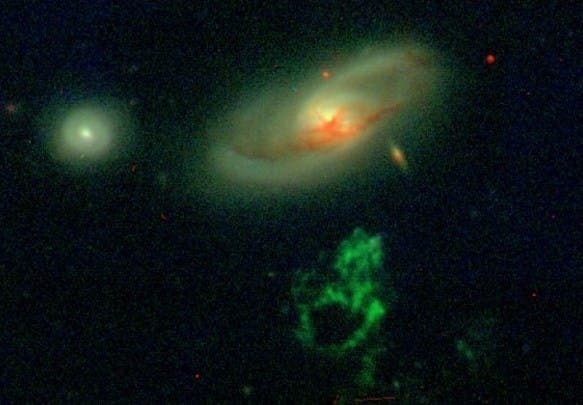 In 2008, the team concluded that less than 100,000 years before IC 2497 became the galaxy we see today , its black hole devouring the adjacent galaxy and sending out a torrent of X-rays that are still reaching the giant gas cloud making it glow green even though the black hole was by then dormant. The astronomer community has been eager to decipher the feeding habits of black holes because these so-called accretion events shutt off galaxy growth by heating and expelling the gas needed to form new stars. SometThree-quarters of the newly discovered 19 clouds have a nearby galaxy that is interacting or merging with another galaxy, according to a new study, which supports the black-hole-blast theory. Throughout the universe, black holes are apparently transforming their host galaxies, then quickly dimishing and dimming from view. "If you could watch the cosmic movie and speed it up, it would be like a Christmas tree, with these [X-ray blasts] popping off in one galaxy, then the next," says Keel. The research will be published in a forthcoming edition of Monthly Notices of the Royal Astronomical Society.